Seriously, I am more of a luxury beach side cottage rental type of girl over a camping girl, but I have found so much joy in our family camping experiences. 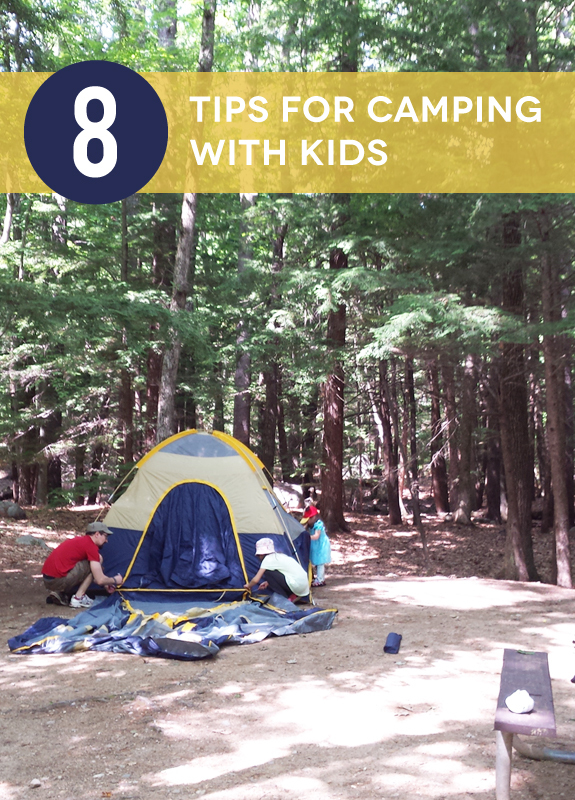 Today I wanted to share 8 tips for camping with kids. Feel free to add any others in the comments below! Giving kids jobs will make them feel that they are part of the team, and also helps kids really experience what camping is all about. Kids can help gather kindling, set up the tent, arrange items inside the tent, etc. Laurel and Vi were really helpful with both setup and breakdown! We didn’t have a ton of rules, per se, but remember that kids will not necessarily have the same context as you do for experiences like this. Our main issues were to talk to them about fire safety, water sources, and trash/food cleanup. Laurel and Violet are 6.5 years apart so especially when Violet was in the toddler zone their physical abilities were very different. Consider splitting up if you have older kids who are up for a longer hike and work out jobs (see #1 above) that are best suited to different ages. Seriously, you’re in the woods -- enjoy unplugging! When we're camping, I love kicking back and relaxing with the girls amidst a pile of books and magazines. They never ask, “Where’s the tablet?” when we're in the woods! One of my favorite things about camping is that it really strips life to the basics; it’s wonderfully slow and simple and I suggest enjoying the slowness! My friend Charles referred to this as “saving the time to breathe.” Charles shared: “Sometimes it's tempting to do the hike and the swimming and the campfire social and the kickball game and the boating... Overtired kids don't make good tent mates.” So true! Related to #2 and #5, we found that many of the tasks associated with camping offered an opportunity to teach the girls about something practical in a setting where we had the time to slow down and chat and teach (vs. just doing it ourselves). For example, we taught the girls about building a fire, how to identify poison ivy, interacting (or not interacting) with animals, etc. Because I'm a city girl at heart, I'm not a fan of fumbling around in woods in the dark so I make a point to collect and arrange in the tent things we might need in the middle of the night, such as water bottles for everyone, flashlights, and extra clothes in case of accidents. I also do a (hopefully final) bathroom run just before it gets pitch black out. During the summer, it's lighter for longer, so don't stress about bedtime. Let them stay up later until it's actually dark enough to fall asleep...enjoy following the rhythms of nature! Do you have other tips to share about camping with kids? Feel free to share via comments below! There's so much good to be had in a good old fashioned camping trip! These 8 tips will help you enjoy your time in the great outdoors.